Light but strong, PolyLevel® doesn’t impose extra weight on marginal soil like masonry-based grout can. 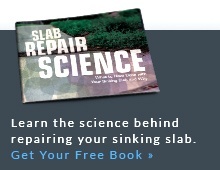 What happens when a concrete slab sinks or settles? Whether sunken concrete occurs in a patio, sidewalk, garage, warehouse or elsewhere, it’s usually important to correct this structural problem as soon as possible. There are a number of ways to do this. PolyLevel® technicians use their extensive knowledge to choose the best solutions to use in every situation. Contact your local dealer today to schedule a free estimate for concrete leveling! Whether you’re an engineer, a homeowner, a real estate agent or a factory foreman, the questions you ask about concrete leveling are likely to be the same: How much does concrete leveling cost? How long will it take? How soon will I be able to use my (patio, sidewalk, driveway, etc.) after the repair? Is the repair permanent? Most of the concrete leveling techniques result in permanent repairs, but other factors can be quite different, as you’ll see. Concrete replacement qualifies as the old-school repair. Instead of attempting to raise a sunken slab, the slab is partially or completely demolished and then replaced with new concrete. Concrete replacement has the disadvantage of taking a long time. Erecting forms, installing proper reinforcement, pouring the concrete, and waiting for the new work to harden and cure can take several days or more. Mud jacking goes by other names, such as slab jacking and grout pumping. This concrete leveling product is a slurry of liquid grout (which can include dirt, Portland cement and sand) that is pumped under a sunken slab to force it upwards by hydraulic pressure. Large holes are drilled in a sunken slab to provide clearance for the pumping nozzle. Care must be taken to prevent messy spillage through gaps and cracks. Once mudjacking is complete, the surface shouldn’t see heavy use until the grout mixture has hardened. Re-leveling grout is sometimes used to “skim-coat” sunken concrete as an alternative to slab raising. The settled slab is simply left in place, and fresh grout or (in some cases) concrete is placed over the old surface. Problems with grout releveling include poor adhesion to the old concrete (which can cause the new material to crack or detach), unattractive appearance and added weight, which can cause further sinking action. 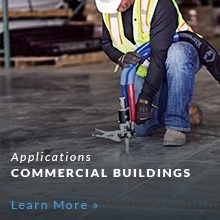 Concrete grinding is a leveling technique that grinds away protruding edges and corners, primarily on concrete sidewalks where slab sections have settled or heaved. This repair sometimes has to be repeated, as slab sections continue to move up or down. It also gives the repair area a strange faceted appearance. Contact us today for a Free Estimate on any of our concrete repair systems, or to find out more information on PolyLevel® concrete lifting & leveling.